DRAGON ARTWORK GRAFFITI PERFORMANCE! The city morphs into a monstrous sea creature but no matter how overwhelming the beast becomes one tiny little fisherman keeps trying to reel it in! 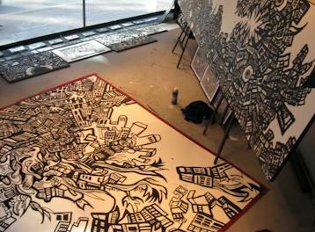 In the fall of 2008 I was invited to do a three day live painting performance in the storefront window of the Hudson Bay Company in downtown Toronto. 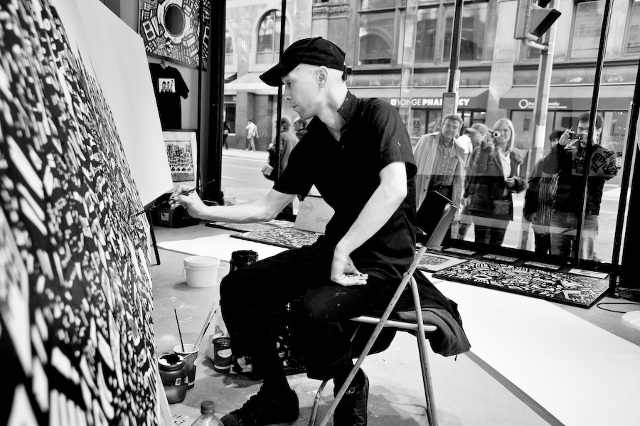 As part of a promotion the retail store exhibited artists at work in it’s prestigious Yonge and Richmond Street window. For my part in the show I set up a display of works and merchandise and painted two enormous weird tales with black ink on white paper. 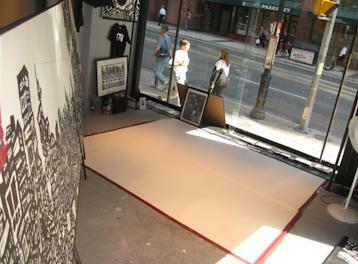 For the first two days of my exhibit I created a 4 x 16 foot dragon artwork. The “City Fish” was a strange parable about the metropolis. 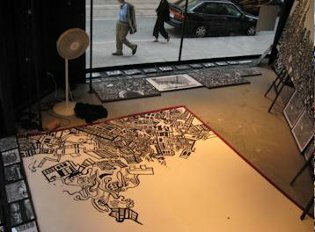 The drawing personified the buildings as a lizard like sea creature and featured a struggle between the oversized urban atrocity and a single, comparatively miniscule, denizen perched atop one of the buildings. This artwork was expressing the individual’s plight for success and survival amidst the often times overwhelming architecture of the big city. The absurdity of the tiny fisherman’s attempts to conquer the beast is reflective of man’s inability to surrender regardless of any obstacles we may have to face. 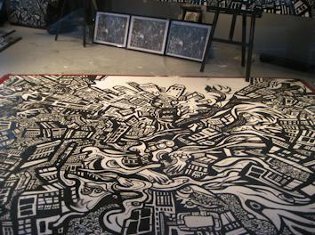 Following the "City Fish" I made a second 15 x 15 foot fable. This mural featured a barrage of serpentine plants attacking the urban skyline. The strange effect of the aggressive vegetations entangled amidst the concrete architecture revealed some sort of underlying entity accumulatively resembling a screaming face. Is it Mother Nature? Progress personified? Or perhaps the vengeful psyche of an angered ancient witch? The imagery deals with nature and the city questioning the conflicts and co-existence of the two forces. 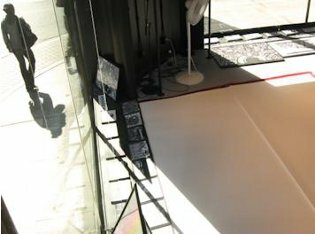 This storefront exhibition was a great experience as I was able to work in the comfort of a studio while gaining the interactions and promotional advantages of a street art performance.